A grant to a youth summer camp and retreat facility allowed a wooded creek area to be developed for recreational use by campers and the community. Development includes trails for walking, frisbee golf, picnics, etc. The new space encourages a healthy lifestyle, not only for the youth, but also for the community at large as they can access and enjoy the area free of charge. 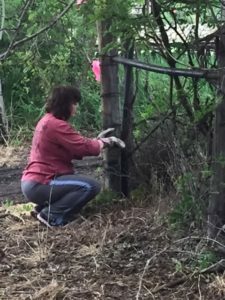 The project was extremely challenging as there were many very large fallen trees to be removed, ten-foot-high weeds to be plowed up, landscaping, planting, etc. Many community members participated in work nights to clear the area of dead branches, trees, old fencing and other debris and those same persons are excited about bringing groups out to utilize the area. Support was also received from persons who were unable to participate in the work nights but sent food and shared equipment to aid in our work. Concrete slabs for two separate picnic areas were poured, picnic tables purchased, and a cover built for one of the picnic areas.